Caterpillar Inc. is an American Fortune 100 corporation which designs, develops, engineers, manufactures, markets and sells machinery, engines, financial products and insurance to customers via a worldwide dealer network. It is the world's largest construction equipment manufacturer. In 2018, Caterpillar was ranked #65 on the Fortune 500 list and #238 on the Global Fortune 500 list. Caterpillar stock is a component of the Dow Jones Industrial Average. Benjamin Holt, one of the founding fathers of Holt Manufacturing Company. The steam tractors of the 1890s and early 1900s were extremely heavy, sometimes weighing 1,000 pounds (450 kg) per horsepower, and often sank into the rich, soft earth of the San Joaquin Valley Delta farmland surrounding Stockton, California. Benjamin Holt attempted to fix the problem by increasing the size and width of the wheels up to 7.5 feet (2.3 m) tall and 6 feet (1.8 m) wide, producing a tractor 46 feet (14 m) wide. But this also made the tractors increasingly complex, expensive and difficult to maintain. 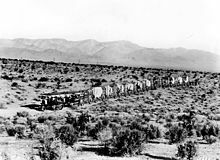 Two Holt 45 gas crawler tractors team up to pull a long wagon train in the Mojave Desert during construction of the Los Angeles Aqueduct in 1909. Another solution considered was to lay a temporary plank road ahead of the steam tractor, but this was time-consuming, expensive, and interfered with earthmoving. Holt thought of wrapping the planks around the wheels. He replaced the wheels on a 40 horsepower (30 kW) Holt steamer, No. 77, with a set of wooden tracks bolted to chains. On Thanksgiving Day, November 24, 1904, he successfully tested the updated machine plowing the soggy delta land of Roberts Island. Contemporaneously Richard Hornsby & Sons in Grantham, Lincolnshire, England, developed a steel plate tracked vehicle which it patented in 1904. This tractor steered by differential braking of the tracks and did not require the forward tiller steering wheel for steering making it the first to do so. Several tractors were made and sold to operate in the Yukon, one example of which was in operation until 1927 remnants of which still exist to this day, but Hornsby were unable to interest the British Military in 1907, although soldiers who witnessed the trials nicknamed the machine a caterpillar. Hornsby therefore found a limited market for their tractor so they sold their patent to Holt in 1911, the same year Holt trademarked "Caterpillar". Company photographer Charles Clements was reported to have observed that the tractor crawled like a caterpillar, and Holt seized on the metaphor. "Caterpillar it is. That's the name for it!" Some sources, though, attribute this name to British soldiers in July 1907. Two years later Holt sold his first steam-powered tractor crawlers for US$5,500, about US$128,000 today. Each side featured a track frame measured 30 inches (760 mm) high by 42 inches (1,100 mm) wide and were 9 feet (2.7 m) long. The tracks were 3 inches (76 mm) by 4 inches (100 mm) redwood slats. Holt received the first patent for a practical continuous track for use with a tractor on December 7, 1907 for his improved "Traction Engine" ("improvement in vehicles, and especially of the traction engine class; and included endless traveling platform supports upon which the engine is carried"). A postcard showing the Caterpillar Tractor Co. plant in Peoria, period 1930–1945. On February 2, 1910, Holt opened up a plant in East Peoria, Illinois, led by his nephew Pliny Holt. There Pliny met farm implement dealer Murray Baker who knew of an empty factory that had been recently built to manufacture farm implements and steam traction engines. Baker, who later became the first executive vice president of what became Caterpillar Tractor Company, wrote to Holt headquarters in Stockton and described the plant of the bankrupt Colean Manufacturing Co. of East Peoria, Illinois. On October 25, 1909, Pliny Holt purchased the factory, and immediately began operations with 12 employees. Holt incorporated it as the Holt Caterpillar Company, although he did not trademark the name Caterpillar until August 2, 1910. The addition of a plant in the Midwest, despite the hefty capital needed to retool the plant, proved so profitable that only two years later the company employed 625 people and was exporting tractors to Argentina, Canada, and Mexico. Tractors were built in both Stockton and East Peoria. On January 31, 2017, after more than 90 years of being headquartered in Peoria, Illinois, the company announced plans to move their headquarters from Peoria to Chicago, Illinois by the end of 2017. The upper echelon of executives, including newly installed CEO Jim Umpleby, would begin relocating later that year, with up to 100 employees total moving by year's end. About 300 employees will work in the new office at an as-yet undecided location once the transition is complete. The company indefinitely suspended planning for the new Peoria headquarters in the fall of 2015 after announcing a restructuring effort that called for up to 10,000 jobs to be cut and about 20 facilities around the world to be closed or consolidated. The changes contributed to $2.3 billion in savings in 2016, but sales and revenue for last year still were more than 40 percent below peak levels of 2012. Umpleby said that decline is a fundamental reason the company's Board of Directors opted to move global headquarters to an area where the global marketplace is in easier reach. The first tanks used in WW1 were manufactured by William Foster & Co. also in Lincolnshire and were introduced to the battlefield in 1916. That company had collaborated with Hornsby in the development of the vehicles demonstrated to the British military in 1907, providing the paraffin (kerosene) engines. Holt's track-type tractors played a support role in World War I. Even before the U.S. formally entered WWI, Holt had shipped 1,200 tractors to England, France and Russia for agricultural purposes. These governments, however, sent the tractors directly to the battlefront where the military put them to work hauling artillery and supplies. When World War I broke out, the British War Office ordered a Holt tractor and put it through trials at Aldershot. The War Office was suitably impressed and chose it as a gun-tractor. Over the next four years, the Holt tractor became a major artillery tractor, mainly used to haul medium guns like the 6-inch howitzer, the 60-pounder, and later the 9.2-inch howitzer. Holt tractors were also the inspiration for the development of the British tank, which profoundly altered ground warfare tactics. Major Ernest Swinton, sent to France as an army war correspondent, very soon saw the potential of a track-laying tractor. :116 Although the British later chose an English firm to build its first tanks, the Holt tractor became "one of the most important military vehicles of all time." A Caterpillar D2, introduced in 1938, at the Serpentine Vintage Tractor Museum, Serpentine, Western Australia. Holt tractors had become well known during World War I. Military contracts formed the major part of the company's production. When the war ended, Holt's planned expansion to meet the military's needs was abruptly terminated. The heavy-duty tractors needed by the military were unsuitable for farmers. The company's situation worsened when artillery tractors were returned from Europe, depressing prices for new equipment and Holt's unsold inventory of military tractors. The company struggled with the transition from wartime boom to peacetime bust. To keep the company afloat, they borrowed heavily. C. L. Best Gas Tractor Company, formed by Clarence Leo Best in 1910 and Holt's primary competitor, had during the war received government support enabling it to supply farmers with the smaller agricultural tractors they needed. As a result, Best had gained a considerable market advantage over Holt by war's end. Best also assumed considerable debt to allow it to continue expansion, especially production of its new Best Model 60 "Tracklayer". Both companies were adversely impacted by the transition from a wartime to a peacetime economy, which contributed to a nationwide depression, further inhibiting sales. On December 5, 1920, 71-year-old Benjamin Holt died after a month-long illness. The banks and bankers who held the company's large debt forced the Holt board of directors to accept their candidate, Thomas A. Baxter, to succeed Benjamin Holt. Baxter initially cut the large tractors from the company's product line and introduced smaller models focused on the agricultural market. When the Federal Aid Highway Act of 1921 funded a US$1 billion federal highway building program, Baxter began refocusing the company towards building road construction equipment. :66 Both companies also faced fierce competition from the Fordson company. Between 1907 and 1918, Best and Holt had spent about US$1.5 million in legal fees fighting each other in a number of contractual, trademark and patent infringement lawsuits. Harry H. Fair of the bond brokerage house of Pierce, Fair & Company of San Francisco had helped to finance C. L. Best's debt and Holt shareholders approached him about their company's financial difficulty. Fair recommended that the two companies should merge. In April and May 1925, the financially stronger C. L. Best merged with the market leader Holt Caterpillar to form the Caterpillar Tractor Co. The new company was headquartered in San Leandro until 1930, when under the terms of the merger it was moved to Peoria. Baxter had been removed as CEO earlier in 1925, and Clarence Leo Best assumed the title of CEO, and remained in that role until October 1951. The Caterpillar company consolidated its product lines, offering only five track-type tractors: the 2 Ton, 5 Ton, and 10 Ton from the Holt Manufacturing Company's old product line and the Caterpillar 30 and Caterpillar 60 from the C. L. Best Tractor Co.'s former product line. The 10 Ton and 5 Ton models were discontinued in 1926. In 1928, the 2 Ton was discontinued. Sales the first year were US$13 million. By 1929, sales climbed to US$52.8 million, and Caterpillar continued to grow throughout the Great Depression of the 1930s. Caterpillar adopted the diesel engine to replace gasoline engines. During World War II, Caterpillar products found fame with the Seabees, Construction Battalions of the United States Navy, who built airfields and other facilities in the Pacific Theater of Operations. Caterpillar ranked 44th among United States corporations in the value of wartime military production contracts. During the post-war construction boom, the company grew at a rapid pace and launched its first venture outside the U.S. in 1950, marking the beginning of Caterpillar's development into a multinational corporation. Caterpillar built its first Russian facility in the town of Tosno, located near St. Petersburg, Russia. It was completed in 16 months, occupied in November 1999, and began fabricating machine components in 2000. It had the first electrical substation built in the Leningrad Oblast since the Communist government was dissolved on December 26, 1991. The facility was built under harsh winter conditions, where the temperature was below −13 °F (−25 °C). The facility construction was managed by the Lemminkäinen Group located in Helsinki, Finland. The $125M Caterpillar Suzhou, People's Republic of China facility, manufactures medium wheel loaders and motorgraders, primarily for the Asian market. The first machine was scheduled for production in March 2009. URS Ausino, in San Francisco, California, manages facility construction. Caterpillar has manufactured in Brazil since 1960. In 2010 the company announced plans to further expand production of backhoe and small wheel loaders with a new factory. Solar Division and Turbomach Division San Diego, California, United States 1981 International Harvester Company Industrial gas turbines Became Solar Turbines Incorporated, a wholly owned subsidiary of Caterpillar Inc.
Balderson, Inc. Wamego, Kansas, United States 1990 Balderson, Inc. Work Tools for Construction and Mining Equipment, e.g. buckets, blades, forks The name of Balderson, Inc., was changed to Caterpillar Work Tools, Inc. in 1998 and remains a wholly owned subsidiary of Caterpillar Inc.
Krupp MaK Maschinenbau GmbH Kiel, Germany 1997 Fried. Krupp GmbH Marine diesel engines Renamed MaK Motoren GmbH, a wholly owned subsidiary of Caterpillar Inc. and will continue to use the MaK brand name. F.G. Wilson Larne, Northern Ireland 1999 Emerson Electric Company Generators. Produces both Cat and Olympian branded generators Asset swap. Emerson acquired Kato Engineering from Caterpillar as part of transaction. Earthmoving Equipment Division Chennai, India 2000 Hindustan Motors Ltd. Construction equipment Renamed Caterpillar India and the service & maintenance is provided by birla group's GMMCO Ltd.
Hindustan PowerPlus Ltd. Mathagondapalli, Tamil Nadu, India 2006 Hindustan Motors Engine components and heavy-duty diesel engines Buyout of joint venture formed in 1988. Renamed Caterpillar Power India Private Ltd. Merged into Caterpillar India in 2008. Lovat Inc. Toronto, Ontario, Canada 2008 Tunnel boring machines 2 April 2008: "This acquisition is Caterpillar's entry into the rapidly expanding tunnel boring machine business, and it represents an excellent strategic fit for our companies and the customers we serve around the world," – Stu Levenick, Caterpillar group president. 2 May 2013: "We continuously evaluate our strategic portfolio to ensure alignment with our long-term strategy and have concluded the tunneling business no longer fits that strategy," – Stu Levenick. Caterpillar Tunneling Canada Corporation (CTCC) have notified employees that it will exit the business and cease production at its facilities by mid-2014. Shin Caterpillar Mitsubishi Ltd. Sagami & Akashi, Japan 2008 Mitsubishi Heavy Industries Construction equipment Joint venture since 1963, after purchase of majority renamed Caterpillar Japan Ltd.
Bucyrus International, Inc. South Milwaukee, Wisconsin, United States 2011 Surface and underground mining equipment Transaction closed without issuing new equity on July 8, 2011 in firm's largest acquisition ever, valued at $8.8 billion. Caterpillar occasionally divests assets that do not align with its core competencies. Kato Engineering Mankato, Minnesota, United States 1999 Emerson Electric Company Large electrical generators Asset swap. Caterpillar acquired F.G. Wilson from Emerson as part of transaction. Agricultural equipment assets DeKalb, Illinois, United States 2002 AGCO Corporation Design, assembly and marketing of Challenger track tractors Although founded as an agricultural equipment manufacturer, Caterpillar exited the business with this sale. Preferred Group of Mutual Funds not applicable 2006 T. Rowe Price Group Inc. Mutual funds Caterpillar Investment Management Ltd. decided to exit the investment management business. Through fiscal year 2010, Caterpillar divided its products, services and technologies into three principal lines of business: machinery, engines and financial products for sale to private and governmental entities. Starting in 2011, Caterpillar reports its financials using five business segments: construction industries, resource industries, power systems, financial products, and all other segments. Caterpillar has a list of some 400 products for purchase through its dealer network. Caterpillar's line of machines range from tracked tractors to hydraulic excavators, backhoe loaders, motor graders, off-highway trucks, wheel loaders, agricultural tractors and locomotives. Caterpillar machinery is used in the construction, road-building, mining, forestry, energy, transportation and material-handling industries. Caterpillar is the world's largest manufacturer of wheel loaders. The medium size (MWL) and large size (LWL) are designed at their Aurora, Illinois facility. Medium wheel loaders are manufactured at: Aurora, Illinois; Sagamihara, Kanagawa, Japan; Gosselies, Charleroi, Belgium; Piracicaba, São Paulo, Brazil; India and the People's Republic of China. Large wheel loaders are manufactured exclusively in the United States on three separate assembly lines at Aurora, Illinois. A portion of Caterpillar's business is in the manufacturing of diesel and natural gas engines and gas turbines which, in addition to their use in the company's own vehicles, are used as the prime movers in locomotives, semi trucks, marine vessels and ships, as well as providing the power source for peak-load power plants and emergency generators. Caterpillar 3116 engine was used up until the mid ’90s until in 1997 Caterpillar introduced the inline 6 cylinder 7.2 litre Caterpillar 3126 engine as its first electronic diesel engine for light trucks and buses. Caterpillar decreased emissions and noise the next year in the 3126B version of the engine, and improved emissions further in 2002 with the 3126E which had an improved high-pressure oil pump and improved electronics. In 2003 Caterpillar started selling a new version of this engine called the C7 to meet increased United States emission standards that came into effect in 2004; it had the same overall design as the 3126 version, but with improved fuel injectors and electronics which included its new Advanced Combustion Emissions Reduction Technology (ACERT) system. In 2007, as ultra-low-sulfur diesel became required in North America, Caterpillar updated the C7 to use common rail fuel injectors and improved ACERT electronics. In June 2008, Caterpillar announced it would be exiting the on-highway diesel engine market in the United States before updated 2010 U.S. Environmental Protection Agency (EPA) emission standards took effect, as costly changes to the engines, which only constituted a small percentage of Caterpillar's total engine sales, would be likely. In October 2010, Caterpillar announced it would buy German engine-manufacturer MWM GmbH from 3i for $810 million. The Caterpillar Defence Products subsidiary, headquartered in Shrewsbury, United Kingdom, provides diesel engines, automatic transmissions and other parts for the UK's Titan armored bridge layer, Trojan combat engineering tank, Terrier combat engineering vehicles, and tank transporters; the Romanian MLI-84 armored personnel carrier and the Swiss Piranha III light armored vehicle, which is currently being developed for use by American light armored formations; large fleets of military trucks in both the U.S. and UK; and the CV90 family of infantry fighting vehicles used by the armies of Sweden, Norway, Finland, Switzerland, the Netherlands and Denmark. This division also provides both propulsion engines and power generation systems to the naval shipbuilding industry, such as the Series 3512B turbocharged V-12 diesel engine for American Virginia class nuclear submarines. Caterpillar diesel engines are also used in San Antonio class amphibious transport docks, Spanish Alvaro de Bazán class frigates, British River class patrol vessels, Mexican Sierra class patrol boats, and Malaysian Kedah class MEKO A-100 offshore patrol vessels. The poor network security of the Caterpillar engines puts America's submarine force at risk for cyberattack. In a recent interview on cybersecurity, the Navy clarified that Caterpillar actually has some of the most secure control systems and will be used as a model of how the Navy will design cyber protections into its control systems. Israel buys bulldozers for the Israel Defense Forces (IDF) from Caterpillar through the U.S. government foreign aid money in their civilian configuration. The military modifications and the installment of vehicle armor are done entirely in Israel by the IDF and Israeli security contractors (Israel Military Industries and Israel Aerospace Industries). The IDF uses many Caterpillar machines such as bulldozers, excavators, wheel loaders and graders mainly for engineering, earthworks and building projects. The most famous machine in use by the IDF's Combat Engineering Corps is the heavy IDF Caterpillar D9 armored bulldozer, which is being used also for combat engineering and combat missions under fire. The Israel Defense Forces' use of highly modified Caterpillar D9 bulldozers has led to Caterpillar being criticized by activists and some shareholders. 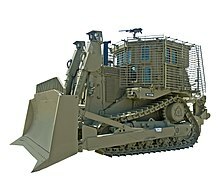 In particular, the IDF Caterpillar D9 was involved in an incident in 2003, in which the American activist Rachel Corrie was killed by a bulldozer. A lawsuit against Caterpillar by her family and families of Palestinians, who were also killed by Caterpillar equipment, was unsuccessful. A lawsuit against Israel and Israeli Defense Ministry was rejected by the court, ruling that her death was an accident, caused by restricted field of view from the heavily armored operators' cabin. In 2014 Presbyterian Church (USA) sold its shares in Caterpillar citing the use of Caterpillar bulldozers involved in demolition and surveillance activities in the West Bank. The Caterpillar Electronics business unit has formed Caterpillar Trimble Control Technologies LLC (CTCT), a 50:50 joint venture with Trimble Navigation to develop electronic guidance and control products for earthmoving machines in the construction, mining and waste industries. CTCT is based in Dayton, Ohio and started its operations on April 1, 2002. Caterpillar introduced the Challenger range of agricultural tractors as the result of several development programs over a long period of time. The program started in the 1970s and involved both D6-based units and Grader power units. A parallel program was also developing wheeled high hp tractors based on using the articulated loading shovel chassis was latter merged with the crawler team. The result was the Challenger Tractor and the "Mobi-Trac" system. The Challenger has been marketed in Europe as Claas machines since 1997, with Caterpillar marketing the Claas built Lexion combine range in the USA. Claas and Caterpillar formed a joint venture, Claas Omaha, to build combine harvesters in Omaha, Nebraska, USA under the CAT brand. In 2002, Cat sold its stake to Claas, and licensed the use of CAT and the CAT yellow livery to Claas. They are marketed as Lexion combines now. Also in 2002, Caterpillar sold the Challenger tracked tractor business to AGCO and licensed the use of the Challenger and CAT names and livery to them. This ended Cat's venture into agriculture. Caterpillar provides financing and insurance to customers via its worldwide dealer network  and generates income through the licensing of the Caterpillar and CAT trademarks and logos. Caterpillar sells the right to manufacture, market and sell products bearing the Cat trademark to licensees worldwide. Wolverine World Wide is one example, a licensee since 1994 and currently the sole company licensed to produce Cat branded footwear. Other licensees sell items including scale models of Cat products, clothing, hats, luggage, watches, flashlights, shovels, knives, fans, gloves, smartphones and other consumer products. Caterpillar products and components are manufactured in 110 facilities worldwide. 51 plants are located in the United States and 59 overseas plants are located in Australia (until 2015), Belgium, Brazil, Canada, China, Czech Republic, England, France, Germany, Hungary, India (Chennai), Indonesia, Italy, Japan, Mexico, the Netherlands, Northern Ireland, Poland, Russia, Singapore, South Africa and Sweden. Caterpillar's historical manufacturing home is in Peoria, Illinois, which also has been the location of Caterpillar's world headquarters and core research and development activities. Although Caterpillar has contracted much of its local parts production and warehousing to third parties, Caterpillar still has four major plants in the Peoria area: the Mapleton Foundry, where diesel engine blocks and other large parts are cast; the East Peoria factory, which has assembled Caterpillar tractors for over 70 years; the Mossville engine plant, built after World War II; and the Morton parts facility. Caterpillar products are distributed to end-users in nearly 200 countries through Caterpillar's worldwide network of 220 dealers. Caterpillar's dealers are independently owned and operated businesses with exclusive geographical territories. Dealers provide sales, maintenance and repair services, rental equipment, and parts distribution. Finning, a dealer based in Vancouver, Canada, is Caterpillar's largest global distributor. Gmmco Ltd is India's No. 1 Dealer for Caterpillar Machines. Most dealers use a management system called DBS for their day-to-day operations. As of the first quarter of 2006, 66% of Caterpillars sales are made by one of the 63 dealers in the United States, with the remaining 34% sold by one of Caterpillar's 157 overseas dealers. Caterpillar has a corporate governance structure where the Chairman of the board also acts as Chief Executive Officer (CEO). The Board of Directors is fully independent and is made up of non-employee directors selected from outside the company. Several group presidents report to the CEO, and multiple vice presidents report to each group president. The board has three committees: Audit; Compensation and Human Resources; Governance and Public Policy. The behavior of all employees is governed by a Code of Worldwide Business Conduct, first published in 1974 and last amended in 2005, which sets the corporate standard for honesty and ethical behavior. Management employees are retested on this code annually. On January 1, 2017, Jim Umpleby succeeded Douglas R. Oberhelman as CEO and Dave Calhoun became Non-Executive Chairman. On December 12, 2018, Umpleby was named chairman of the board as well, reversing Caterpillar's previous decision to split the CEO and chairman position. As of December 31, 2009, Caterpillar employed 93,813 persons of whom 50,562 are located outside the United States. Current employment figures represent a decline of 17,900 employees compared the third quarter of 2008. Due to the restructuring of business operations which began in the 1990s, there are 20,000 fewer union jobs in the Peoria, Illinois area while employment outside the U.S. has increased. Caterpillar came close to bankruptcy in the early 1980s, at one point losing almost US$1 million per day due to a sharp downturn in product demand as competition with Japanese rival Komatsu increased. (At the time, Komatsu used the internal slogan "encircle Caterpillar".) Caterpillar suffered further when the United States declared an embargo against the Soviet Union after the Soviet invasion of Afghanistan, causing the company to be unable to sell US$400 million worth of pipelaying machinery that had already been built. Due to the drastic drop in demand, Caterpillar initiated employee layoffs, which led to strikes, primarily by the members of the United Auto Workers, against Caterpillar facilities in Illinois and Pennsylvania. Several news reports at the time indicated that products were piling up so high in facilities that replacement workers could barely make their way to their work stations. In 1992, the United Auto Workers conducted a five-month strike against Caterpillar. In response, Caterpillar threatened to replace Caterpillar's entire unionized work force. Over ten thousand UAW members struck again in 1994–1995 for 17 months, a record at that time. The strike ended with the UAW deciding to return to work without a contract despite record revenues and profits by Caterpillar. In 1994, Caterpillar offered a contract to the UAW members that would have raised the salary of top workers from $35,000 to $39,000 per year. However, the UAW was seeking the same top wage of $40,000 that was paid to workers at Deere & Company in 1994. During the strikes, Caterpillar used management employees in an attempt to maintain production. It suspended research and development work, sending thousands of engineers and other non-bargained for employees into their manufacturing and assembly facilities to replace striking or locked out union members. Rather than continuing to fight the United Auto Workers, Caterpillar chose to make itself less vulnerable to the traditional bargaining tactics of organized labor. One way was by outsourcing much of their parts production and warehouse work to outside firms. In another move, according to UAW officials and industry analysts, Caterpillar began to execute a "southern strategy". This involved opening new, smaller plants, termed "focus facilities", in right-to-work states. Caterpillar opened these new facilities in Clayton and Sanford, North Carolina; Greenville, South Carolina; Corinth, Mississippi; Dyersburg, Tennessee; Griffin and LaGrange, Georgia; Seguin, Texas; and North Little Rock, Arkansas. In 2012, the company locked out workers at a locomotive plant in London, Ontario, Canada and demanded some accept up to a 50% cut in pay, in order to become cost-competitive with comparable Caterpillar manufacturing facilities in the United States. The move created controversy in Canada, with some complaining the plant was acquired under false pretenses. Retail store Mark's Work Wearhouse began pulling Caterpillar boots from its shelves as a result. On May 1, 2012, 780 members of the International Association of Machinists and Aerospace Workers Local Lodge 851 went on strike. An agreement was reached in August, resulting in a 6-year wage freeze. Striking workers expressed anger about the freeze given the company's record 2011 profits and CEO Oberhelman's 60% salary increase. Caterpillar divisions have won Illinois Governor's Pollution Prevention Awards every year since 1997. Caterpillar was awarded the 2007 Illinois Governor's Pollution Prevention Award for three projects: The Hydraulics and Hydraulic Systems business unit in Joliet implemented a flame sprayed coating for its truck suspension system, replacing a chroming process, reducing hazardous waste by 700,000 pounds annually and saving 14 million US gallons (53,000 m3) of water. Caterpillar's Cast Metals Organization in Mapleton worked with the American Foundry Society to help produce a rule to reduce hazardous waste in scrap metal that meet strict quality requirements, and also allow foundries to continue recycling certain types of scrap and maintain a competitive cost structure. Caterpillar's Mossville Engine Center formed a team to look at used oil reuse and recycle processes that forced MEC to send large amounts of used oil off-site for recycling, and developed an updated system for reclaiming it for reuse on-site. The resulting benefits included a usage reduction of about 208,000 US gallons (790 m3) of oil per year. Caterpillar in 2004 participated in initiatives such as the United States Environmental Protection Agency's National Clean Diesel Campaign program, which encourages retrofitting fleets of older buses and trucks with newer diesel engines that meet higher emissions standards. In 2005, Caterpillar donated $12 million to The Nature Conservancy in a joint effort to protect and preserve river systems in Brazil, U.S.A., and China. Caterpillar has, for many years, been a member of the World Business Council for Sustainable Development based in Geneva, Switzerland and has been listed on the Dow Jones Sustainability World Index each year since 2001. In July 1999, Caterpillar and five other diesel engine manufacturers signed a consent decree with the Justice Department and the State of California, after governmental investigations revealed violations of the Clean Air Act. The violation involves over a million diesel engines sold with defeat devices, devices that regulated emissions during pre-sale tests, but that could be disabled in favor of better performance during subsequent highway driving. Consequently, these engines "...emit up to triple the permissible level of smog-forming nitrogen oxides (NOx). In 1998 alone, these violating vehicles emitted 1.3 million tons of additional NOx – an amount equal to the emissions of 65 million cars." For this reason, Caterpillar was named the "Clean Air Villain of the Month" for August 2000 by the Clean Air Trust. The consent decree provided that $83 million be paid in civil penalties and determined new deadlines for meeting emissions standards. Caterpillar, however, was successful in lobbying for an extension of deadlines they considered too severe. Even so, in October 2002, Caterpillar – the only diesel engine company (of those that signed decrees) to fail to meet the new emissions standards deadline – was forced to pay $128 million in per-engine non-conformance penalties. In March 2017, when US federal agents raided Caterpillar's headquarters in Peoria Ill., it was already evident that the company engaged in aggressive measures to control tax costs. Since April 2014, the company's tax policies have been investigated by a senate subcommittee headed by Senator Carl Levin. Those investigations uncovered significant changes in Caterpillar's offshore tax strategy, culminating in the creation of the new Swiss subsidiary Caterpillar SARL (CSARL) in Geneva. In 1999, the former Caterpillar executive Daniel Schlicksup accused the company of funneling profits from replacement parts to Switzerland where it had no warehouses or factories. The Internal Revenue Service found the firm liable for a billion dollars of unpaid taxes for the years 2007 to 2009. At the same time, the architect of Caterpillar's fiscal strategy, PricewaterhouseCoopers (PWC) came also under scrutiny, owing this to a conflict of interest, acting as Caterpillar's global tax consultant and controller. The Senate uncovered documents from PWC saying the elaborate move was simply a way to evade American taxes. "We are going to have to do some dancing" one said. Another noted, "What the heck, we will all be retired when this comes up on audit." In 2004 the Office of the UN High Commissioner on Human Rights sent a warning letter to the company about its sales of bulldozers to the Israel Defense Forces (IDF) and which were used in part to destroy Palestinian farms. Caterpillar is a leading member of the U.S. Global Leadership Coalition, a Washington D.C.-based coalition of over 400 major companies and NGOs that advocates for increased funding of American diplomatic and development efforts abroad through the International Affairs Budget. Economic development projects in developing countries (particularly in rural, agricultural regions) serve as new markets for Caterpillar products by improving political and economic stability and raising average incomes. 2011 recipient of the Henry C. Turner Prize for Innovation in Construction Technology from the National Building Museum. ^ a b c d e f "Caterpillar 2017 SEC Filing". sec.gov. Retrieved 22 February 2018. ^ a b c d "Caterpillar – About Cat". cat.com. Caterpillar Inc. 2010. Archived from the original on March 11, 2010. Retrieved 2010-03-11. We deliver products, services and technologies in three principal lines of business: Machinery, Engines and Financial Products. ^ a b c "2009 Form 10-K". United States Securities and Exchange Commission. February 19, 2010. Archived from the original on March 24, 2010. Retrieved 2010-03-23. As of December 31, 2009, we employed 93,813 persons of whom 50,562 were located outside the United States. ^ Haddock, Keith; Orlemann, Eric (2001-11-11). Paul Johnson, ed. Classic Caterpillar Crawlers. St. Paul, Minnesota, United States: MBI Publishing Company. pp. 37–38. ISBN 978-0-7603-0917-9. Retrieved 2010-11-06. ^ "Fortune Global 500 List 2018: See Who Made It". Fortune. Retrieved 2018-11-10. ^ "Caterpillar Tractor Co. List of Deals". Lehman Brothers Collection. President and Fellows of Harvard College. 2010. Archived from the original on June 29, 2010. Retrieved 2010-11-06. In 1925 Holt and C.W. Best's company merged to form the Caterpillar Tractor Company. ^ a b Buedel, Matt (January 31, 2017). "Caterpillar moving headquarters, CEO from Peoria to Chicago". Peoria Journal Star. ^ Yerak, Becky (31 Jan 2017). "Caterpillar will move headquarters to Chicago area, citing transportation access". The Chicago Tribune. Retrieved 17 July 2017. ^ "Contact Us – CAT Footwear". ^ a b c d Pernie, Gwenyth Laird (March 3, 2009). "Benjamin Holt (1849–1920): The Father of the Caterpillar tractor". Archived from the original on August 3, 2012. ^ Bellis, Mary. 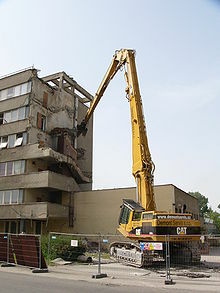 "History of Bulldozers". About.com. Retrieved 2010-02-28. ^ "Agricultural Machinery, Business History of Machinery Manufacturers". Archived from the original on October 17, 2012. ^ a b "Caterpillar History". Archived from the original on July 19, 2011. Retrieved 2010-02-28. ^ a b Leffingwell, Randy (1996). Classic Farm Tractors: History of the Farm Tractor. Crestline Imprints. ISBN 978-0-7603-0246-0. ^ a b Gordon, Paul (February 16, 2010). "Cat hits 100-year milestone: Holt Caterpillar started operations in East Peoria in 1910 with 12 employees". Peoria, Illinois: Journal Star. Retrieved 2010-02-28. ^ Orleman, Eric C. (2006). Caterpillar. MBI Publishing Company. pp. 8–9. ISBN 978-0-7603-2553-7. Retrieved July 13, 2009. ^ "Newly Incorporated". January 13, 1892. ^ "Caterpillar History". Retrieved 2011-02-07. ^ "Holt Caterpillar". Archived from the original on December 4, 2009. Retrieved 2010-02-27. ^ a b "The Holt 15-ton Tractor". Retrieved 2011-02-26. ^ "HOLT CAT – Texas Caterpillar Dealer Equipment Sales and Service". 2007. Archived from the original on 2007-04-19. Retrieved 2010-02-24. ^ Swinton, Ernest (1972). Eyewitness. Ayer Publishing. ISBN 978-0-405-04594-3. ^ a b "Caterpillar On-Highway Engines: About Us>History>Growth". ohe.cat.com. Caterpillar Inc. 2007. Archived from the original on August 4, 2007. Retrieved February 24, 2010. ^ "Pacific Rural Press". 100 (24). December 11, 1920. ^ "Caterpillar History". Archived from the original on July 19, 2011. Retrieved 2010-02-28. ^ "Best Tractor History". Retrieved 2010-02-24. ^ Robert Brooks (November 6, 2011). "Caterpillar to Manufacture Off-Highway Trucks in Russia". ^ "Caterpillar in Brazil". Retrieved September 21, 2014. ^ "Caterpillar Announces Plans for New Manufacturing Facility in Brazil" (PDF). Retrieved September 21, 2014. ^ "Cat Lift Trucks : About Cat". Retrieved September 21, 2014. ^ "Solar Turbines: About Solar". Retrieved September 21, 2014. ^ . archives.hcea.net (July 17, 2013). Retrieved on 2013–07–17. ^ Ehrlich, Jennifer (1997-03-16). "Caterpillar to expand Brooklyn Park plant". ^ "Caterpillar Inc, Form 8-K, Current Report, Filing Date Dec 16, 1996". secdatabase.com. Retrieved Mar 20, 2013. ^ "Caterpillar Acquisition". The New York Times. 1996-07-03. ^ "Caterpillar Inc, Form 8-K, Current Report, Filing Date Dec 11, 1997". secdatabase.com. Retrieved Mar 20, 2013. ^ "Caterpillar Inc – 8-K – For 2/2/99". Retrieved September 21, 2014. ^ "Caterpillar Inc, Form 8-K, Current Report, Filing Date Jun 4, 1996". secdatabase.com. Retrieved Mar 20, 2013. ^ Henry McDonald (January 8, 2009). "FG Wilson engineering firm cuts 250 jobs". The Guardian. Retrieved November 12, 2014. ^ Osenga, Mike (2000). "CNH Sells Tractor Operations … Cat Buys The Rest Of Elphinstone … Parker Buys Wynn's … Manitowoc Consolidates – Brief Article". Diesel Progress North American Edition. Archived from the original on January 7, 2016. ^ "Caterpillar Completes Acquisition of Sabre". Retrieved August 25, 2016. ^ "Caterpillar Buys Italian Road Construction Firm". Retrieved September 21, 2014. ^ a b "Caterpillar Inc, Form DEF 14A, Filing Date Feb 24, 2005" (PDF). secdatabase.com. Retrieved Mar 20, 2013. ^ "Caterpillar Inc, Form 10-K, Annual Report, Filing Date Feb 24, 2005". secdatabase.com. Retrieved Mar 20, 2013. ^ "Caterpillar Inc, Form 8-K, Current Report, Filing Date May 16, 2006" (PDF). secdatabase.com. Retrieved Mar 20, 2013. ^ "Caterpillar buys privately held rail services firm for $1B". Retrieved September 21, 2014. ^ "Caterpillar Inc, Form 10-K, Annual Report, Filing Date Feb 23, 2007". secdatabase.com. Retrieved Mar 20, 2013. ^ Caterpillar completes acquisition of joint-venture operations in India | Articles | South Asian Connection Archived June 5, 2009, at the Wayback Machine. Indusbusinessjournal.com. Retrieved on March 17, 2011. ^ a b "Caterpillar Inc, Form 10-K, Annual Report, Filing Date Feb 22, 2008" (PDF). secdatabase.com. Retrieved Mar 20, 2013. ^ "Caterpillar Completes Acquisition of European Remanufacturing Company, Eurenov S.A". Retrieved September 21, 2014. ^ "Caterpillar Announces Acquisition of Blount's Forestry Division and Transition of Pioneer Machinery to Six Caterpillar Dealers – Industry News – Site Prep". Archived from the original on March 10, 2012. Retrieved September 21, 2014. ^ "Caterpillar Inc, Form 8-K, Current Report, Filing Date Mar 12, 2008". secdatabase.com. Retrieved Mar 20, 2013. ^ a b "Caterpillar Inc, Form 10-Q, Quarterly Report, Filing Date Aug 1, 2008" (PDF). secdatabase.com. Retrieved Mar 20, 2013. ^ "Caterpillar, Mitsubishi Heavy Industries and Shin Caterpillar Mitsubishi Announce". Reuters. March 26, 2008. Archived from the original on September 5, 2009. ^ "Caterpillar Inc, Form 10-K, Annual Report, Filing Date Feb 20, 2009" (PDF). secdatabase.com. Retrieved Mar 20, 2013. ^ "Caterpillar (CAT) Acquires Stock of MGE Equipamentos & Servicos". StreetInsider.com. Retrieved September 21, 2014. ^ "Caterpillar Inc, Form 10-Q, Quarterly Report, Filing Date Oct 31, 2008" (PDF). secdatabase.com. Retrieved Mar 20, 2013. ^ "Caterpillar to Expand Remanufacturing Business With Acquisition of Certain Gremada". Reuters. June 16, 2008. Archived from the original on September 8, 2009. ^ On the right track: Twin City Signal – Railway Track and Structures Archived June 3, 2012, at the Wayback Machine. Rtands.com (August 28, 2009). Retrieved on 2011–03–17. ^ "Caterpillar Inc, Form 10-Q, Quarterly Report, Filing Date May 3, 2010" (PDF). secdatabase.com. Retrieved Mar 20, 2013. ^ "Caterpillar Announces Acquisition of JCS Co., Ltd" (PDF). Retrieved September 21, 2014. ^ Progress Rail Acquires GE Transportation's Inspection Products Business – Progress Rail Services. Progressrail.com (March 2, 2010). Retrieved on 2011–03–17. ^ "Caterpillar Inc, Form 10-Q, Quarterly Report, Filing Date Jul 30, 2010". secdatabase.com. Retrieved Mar 20, 2013. ^ "Caterpillar unit buys FCM Rail". Businessweek.com. Archived from the original on January 7, 2016. Retrieved September 21, 2014. ^ "Updates from Portec Rail, MGE, Eckert Seamans and ShipXpress". Progressive Railroading. Retrieved September 21, 2014. ^ "Caterpillar Inc, Form 8-K, Current Report, Filing Date Jun 1, 2010". secdatabase.com. Retrieved Mar 20, 2013. ^ Acquisition Positions Caterpillar to Deliver Subsurface Imaging and Mapping Services Archived July 11, 2011, at the Wayback Machine. Forconstructionpros.com (January 12, 2011). Retrieved on 2011–03–17. ^ China Business News: Caterpillar to buyout Caterpillar Xuzhou. Chinaknowledge.com (June 29, 2010). Retrieved on 2011–03–17. ^ "Caterpillar Emissions Solutions Expands Capabilities Through Acquisition of CleanAIR Systems". Retrieved September 21, 2014. ^ a b "Caterpillar Inc, Form 10-Q, Quarterly Report, Filing Date Nov 4, 2011" (PDF). secdatabase.com. Retrieved Mar 20, 2013. ^ a b "Caterpillar buys 3i's engine maker MWM for $810 million". Reuters. 2010-10-22. ^ "Caterpillar Inc, Form 8-K, Current Report, Filing Date Jul 8, 2011" (PDF). secdatabase.com. Retrieved Mar 20, 2013. ^ "Caterpillar Completes Acquisition of Bucyrus" (PDF). Retrieved September 21, 2014. ^ "Cat – Products & Services – North America – Caterpillar". Retrieved September 21, 2014. ^ "Caterpillar Inc, Form 8-K, Current Report, Filing Date Feb 4, 1999". secdatabase.com. Retrieved Mar 20, 2013. ^ "Caterpillar Inc, Form 8-K, Current Report, Filing Date Dec 17, 2001". secdatabase.com. Retrieved Mar 20, 2013. ^ Kathie O'Donnell. "T. Rowe Price to acquire Caterpillar unit funds". Retrieved September 21, 2014. ^ "Caterpillar buys Blount's local unit". 2007-11-26. ^ Terex Corporation acquires ASV | Banking & Finance > Financial Markets & Investing from. AllBusiness.com. Retrieved on March 17, 2011. ^ "Caterpillar Inc, Form 10-Q, Quarterly Report, Filing Date Nov 2, 2012" (PDF). secdatabase.com. Retrieved Mar 20, 2013. ^ "Platinum Equity » News – Caterpillar Completes Sale of Third-Party Logistics Business to Platinum Equity". Retrieved September 21, 2014. ^ "Annual Report 2005 on SEC Filing Form 10-K". Caterpillar, Inc. 2006-05-31. Retrieved 2017-02-25. ^ "Annual Report 2010 on SEC Filing Form 10-K". Caterpillar, Inc. 2011-02-22. Retrieved 2017-02-25. ^ "Annual Report 2015 on SEC Filing Form 10-K". Caterpillar, Inc. 2016-02-16. Retrieved 2017-02-25. ^ "Annual Report 2016 on SEC Filing Form 10-K". Caterpillar Inc. 2017-02-15. Retrieved 2017-02-25. ^ "Caterpillar Financial Statements 2005-2018 | CAT". www.macrotrends.net. Retrieved 2018-10-30. ^ "Caterpillar Inc, Form 10-Q, Quarterly Report, Filing Date May 9, 2011" (PDF). secdatabase.com. Retrieved Mar 20, 2013. ^ "Cat – Produtos e Serviços – América Latina – Caterpillar". Retrieved August 5, 2015. ^ "'On-highway truck'". Retrieved September 21, 2014. ^ "CATERPILLAR TO END PRODUCTION OF ON-HIGHWAY VOCATIONAL TRUCKS". ^ a b c d McDonald, Bob (27 September 2012). "Understanding and Profiting From the Caterpillar C7 – Engine Builder Magazine". Engine Builder Magazine. ^ "Caterpillar demonstrates 2007 compliant on-highway engine". Pit & Quarry. Archived from the original on 2006-06-15. Retrieved 2007-08-31. ^ "Caterpillar exits on-highway engine business". Today's Trucking. Retrieved October 13, 2012. ^ Hinton, Christopher. "Caterpillar signs alliance deal with Navistar". MarketWatch. The Wall Street Journal. Archived from the original on May 9, 2013. Retrieved October 13, 2012. ^ "Caterpillar Defence Products". Armed Forces – The Defence Suppliers Directory. R & F Defence Publications. Retrieved 2007-08-04. ^ "MEKO A Class Corvettes / Frigates, Germany". naval-technology.com. Retrieved 2008-09-16. The Kedah Class MEKO A-100 patrol vessel being built for Malaysia has a displacement of 1,650t. The propulsion system is based on two Caterpillar 3616 (5,450kW) diesel engines each driving two controllable pitch propellers. ^ Majumdar, Dave (22 October 2014). "NAVSEA: Submarines Control Systems are at Risk for Cyber Attack". usni.org. U.S. NAVAL INSTITUTE. Retrieved 22 October 2014. ^ "NAVSEA Chief Talks Risk, Cyber and A New Era of Naval Shipbuilding". USNI News. Retrieved August 5, 2015. ^ "Caterpillar digs in on Israeli bulldozer battle". Archived from the original on October 29, 2014. Retrieved September 21, 2014. ^ "Caterpillar faces an intifada". Archived from the original on June 6, 2011. Retrieved September 21, 2014. ^ Gerstein, Josh (2007-09-18). "Caterpillar Escapes Liability For Israeli Bulldozer Operations". The New York Sun. TWO SL LLC. Archived from the original on June 25, 2009. Retrieved 2010-09-19. ^ Tanner, Adam (September 17, 2007). "Court dismisses suit over Israeli bulldozing". reuters.com. Thomson Reuters. Archived from the original on September 20, 2010. Retrieved 2010-09-19. The U.S. government paid for the bulldozers, which were transferred to the Israel Defense Forces. ^ Stoil, Rebecca Shimoni (21 June 2014). "'We cannot profit from the destruction of homes and lives,' Presbyterians say". The Times of Israel. Retrieved 21 June 2014. ^ Liszewski, Andrew (18 February 2016). "Caterpillar's New S60 Is the First Smartphone With FLIR Thermal Imaging Built Right In". Gizmodo. Retrieved 3 October 2016. ^ "Buy Caterpillar Apparel, Collectibles & More". shopcaterpillar.com. SureSource LLC. 2010. Archived from the original on September 20, 2010. Retrieved 2010-09-20. shopcaterpillar.com is operated by SureSource LLC., under license from Caterpillar Inc.
^ "Corporate Overview". Archived from the original on September 26, 2014. Retrieved September 21, 2014. ^ Narasimhan, T. E. (2014-11-09). "Our vision is to be a leader wherever we do business: Ed Rapp". Business Standard India. Retrieved 2017-03-23. ^ "Caterpillar | Committees & Charters". www.caterpillar.com. Retrieved 2018-12-14. ^ "Caterpillar | Board of Directors". www.caterpillar.com. Retrieved 2018-12-14. ^ "Board of Directors". caterpillar.com. 2018-12-14. ^ "CATERPILLAR CHAIRMAN AND CEO DOUG OBERHELMAN ELECTS TO RETIRE IN 2017; JIM UMPLEBY ELECTED AS CATERPILLAR'S NEXT CEO; DAVE CALHOUN TO BECOME NON-EXECUTIVE CHAIRMAN OF THE BOARD". Caterpillar Inc. 2016-10-17. Retrieved 2016-10-27. ^ Hufford, Austen (2018-12-13). "Caterpillar Puts CEO Back in Charge of Board". The Wall Street Journal. Archived from the original on 2018-12-14. Retrieved 2018-12-13. ^ "Management". Retrieved August 5, 2015. ^ "Caterpillar Inc". Retrieved September 21, 2014. ^ "Union Agrees To End Strike At Caterpillar". The New York Times. April 15, 1992. ^ Burns, Matthew (June 24, 1996). "Caterpillar rolls into Lee County". Triangle Business Journal. Raleigh, North Carolina: American City Business Journals, Inc. Archived from the original on March 9, 2011. Retrieved 2011-03-08. Locating plants in non-union states such as North Carolina is part of Caterpillar's effort to decrease the impact of organized labor on production, according to union officials and analysts. ^ "Caterpillar gives Ontario harsh lesson in union-busting by shutting locomotive plant". The Star. Toronto. 2012-02-05. ^ Olive, David (2012-02-05). "Caterpillar likes to play hardball – so let's play hardball". The Star. Toronto. ^ "Mark's Work Wearhouse pulls Caterpillar boots to protest closure of London plant". The Star. Toronto. 2012-02-05. ^ Greenhouse, Steven (2012-08-17). "Caterpillar Workers Ratify Deal They Dislike". New York Times. New York. ^ "Governor's Awards Previous Winners". Illinois Sustainable Technology Center. Champaign, Illinois: Institute of Natural Resource Sustainability, University of Illinois at Urbana–Champaign. Archived from the original on May 13, 2008. Retrieved March 21, 2010. ^ "Diesel Engine School Bus Retrofit Technology Workshop, Baltimore, MD, April 29, 2004". Maryland Department of the Environment. Archived from the original on December 25, 2008. Retrieved 2007-08-31. ^ "$12 Million from Caterpillar Inc. to The Nature Conservancy Launches Ambitious Global Freshwater River Project and Establishes a Great Rivers Center". The Nature Conservancy. Archived from the original on December 14, 2006. Retrieved 2007-08-31. ^ "WBCSD member companies". World Business Council for Sustainable Development. 2007-08-03. Archived from the original on April 18, 2003. Retrieved 2007-08-04. ^ "Dow Jones Sustainability World Index Recognizes Caterpillar's Leadership for the Fifth Consecutive Year". PRNewswire. 2005-09-21. Retrieved 2007-08-31. ^ "Six Diesel Engine Companies". Clean Air Villain of the Month. Clean Air Trust. 2000-08-01. Retrieved 2007-08-05. ^ "Justice Department Announces FY2003 Record Year For Recovery Of Civil Penalties In Environmental Cases". United States Department of Justice. 2003-12-16. Retrieved 2007-08-05. ^ Bushey C. (2017). Feds search Caterpillar HQ. Crain's Chicago Business. Retrieved 3 March 2017. ^ "The UN vs. Caterpillar". Haaretz. 16 June 2004. ^ "US bulldozer firm in Mid-East row". BBC. 15 June 2004. ^ "U.S. Global Leadership Coalition, Global Trust members". U.S. Global Leadership Coalition. Retrieved September 21, 2014. Wikimedia Commons has media related to Caterpillar Inc.. This page was last edited on 18 April 2019, at 20:15 (UTC).